Concentrated Solar Power can be a economical way of generating clean electricity on a small to medium scale. By using optical lenses or mirrors and high efficiency solar photo voltaic cells you can generate electricity at a lower cost. The lense and solar cell pairs are often grouped on larger structures that track the sun for a higher energy return. An alternative construction is to have mirrors directing sunlight on to a central tower with the high efficieny cells. Parabolic mirror dishes with solar cells at the focus point that track the sun can also be used. 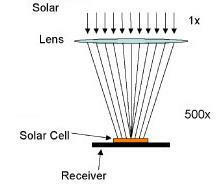 Sunlight can be magnified at a range of up to 500x to 1000x which strike solar cells with efficiencies of 35% to 40%. This makes the maximum use of the solar cells and makes solar cells a lower proportion of the overall structures costs. Conventional manufacturing is required for the lenses, mirrors, sun tracking motors, controllers and support structures. Local jobs and materials can contribute to creating Concentrated Solar Power. The largest proposed project in Victoria Australia is a 154 million watt plant costing $420 M AUD. This is made up of multiple sites with central tower style concentrated solar power. This is enough power for 45000 homes. The environmental benefit will be a reduction in greenhouse gases by 400,000 tonnes per year. The running costs of Concentrated Solar Power are cheaper than diesel generators. Concentrated Solar Power can be built above other land use such as car parks or roofs. This also provides shade and cooling for what is below. Arid non farming land can be used to create electricity. Concentrated Solar Power energy production and daily energy demand track in a similar fashion with temperature. Concentrated Solar Power uses conventional materials such as metal and glass and known skills such as metal fabrication optics and motors. Concentrated Solar Power uses less land than flat panel solar power. Avoids variability of future energy prices. The areas needed for Concentrated Solar Power can be large. Mirrors and lenses may require periodic cleaning. Motors and sun tracking add a complexity to this form of solar power. Structures need to be built to withstand wind loading. Solar Thermal Energy. Using the suns heat to heat water to run in a conventional thermal power generator. Medium to Large Sized Concentrated Solar System manufacturer Uses parabolic dish and central tower designs. Small Sized Concentrated Solar System manufacturer Uses 9 lenses/cells in a square metre sun tracking enclosure.